Little people love pampering too! Guests are now able to introduce the world of peace and tranquility of the Spa to their children with dedicated treatments especially for young skin. 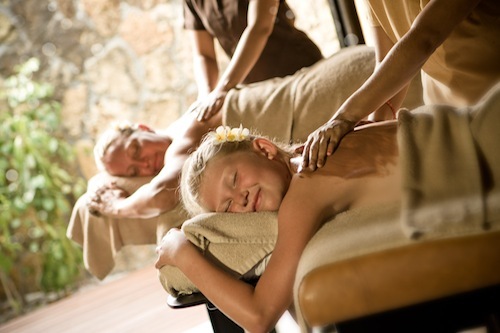 The Spa is a haven of stillness and harmony and a perfect place for children to experience their first spa treatment. The spa retreat is nestled in the heart of the island, a haven of lush and fertile greenery reached via a winding pebble path, wild blossoms and relaxing water streams. 20 individual spa pavilions, including five dedicated Ayurvedic suites, allow guests the ultimate relaxation and pampering experiences within complete privacy. The spa complex also features hydrotherapy and plunge pools, sauna and steam rooms. A dedicated Relaxation Lounge overlooking the tranquil spa gardens promotes quiet reflection and inner harmony. Guests are invited to tempt their children in to the adult world of spa where they can experience total calm and stillness and enjoy specially formulated treatments for young and fragile skin. Age old and traditional treatments from India are also introduced. Ayurveda is an alternate medical system which has specific therapies and practices specialising with children’streatments known as ‘Kaumara Britya’. Kaumara Britya focuses on many therapies that promote better growth and health of our children’s body and mind. The signature treatments include ‘Peas in a Pod’, the ultimate bonding experience… divine treatments can be chosen from both the child and adult spa menu and treatments will be enjoyed together. A heavenly way for guests to spend quality time with their little people in the peace and calm of The Spa.